“We’re here to launch the map, but we’re also here to celebrate multi-stakeholder collaboration.” These words －shared by Zarina Khan－marked the beginning of the launch of BRIDGE’s Post-School Access Map. 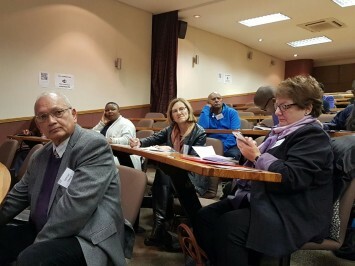 The launch, which was held on 24 August at the Wits Business School, celebrated the collaborative and organic development of the comprehensive, online resource. The map offers information and practical guidelines on different post-school learning pathways and aims to support the transition of young people from the education system into the world of work, either in employment or in entrepreneurship. Following on from Zarina’s opening remarks, Samuel Isaacs －the former head of the South African Qualifications Authority (SAQA) and BRIDGE Board member－spoke to the importance of empowering young people to take control of their own career paths. “Your career is your business,” Samuel announced before stressing the importance and value of resources like the map that “enable young people to empower themselves, not just with knowledge, but with skills and values and the right sort of attitude”. Given the staggering unemployment rate, particularly among South Africa’s youth, the value of helping young people proactively manage their careers cannot be overstated. Samuel Isaacs, Melissa King, Pat Sullivan and Vuyiswa Ncontsa. Gail Campbell (CEO at the Zenex Foundation) addressed the audience after Samuel and shared some insights into the process of developing the map. Gail referred to the innovative nature of the map, and emphasised the ground-breaking features of the collaborative development process. 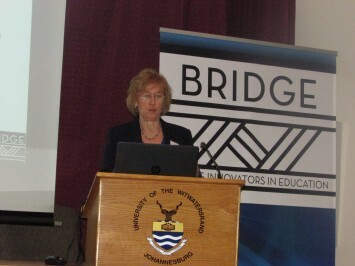 Gail began by describing the Zenex Foundation’s focus on tertiary access, an interest which led the organisation to support BRIDGE in the development of the Post-School Access Map. Gail described the partnership as “a real experience of sharing” and stressed the value of sharing experiences and working practice. The development of the map brought together a ‘brain trust’ of stakeholders in a meaningful way and the result, Gail explained, represents a significant step for the sector. Next was Barbara Dale-Jones (BRIDGE’s former CEO) who described the journey from the map’s inception to the final product. Barbara explained that the map emerged organically from one of BRIDGE’s Communities of Practice, the National Maths & Science CoP. The CoP, which was established in 2010, brings together a number of stakeholders and organisations working in the area of maths and science learner support. One of the CoPs focus areas is tertiary access. Impelled by this focus, a sub-group or working group (the Post-School Access Working Group) created a post-school access chain. This chain charted the progress of a learner from Grade 9 to the world of work and formed the blueprint for what would later become the Post-School Access Map. Following on from the creation of this chain, BRIDGE－in its Knowledge Management capacity－worked together with the working group to map the chain onto the online platform that is now the Post-School Access Map. Barbara drew attention to the synergistic nature of the work that went into developing the chain and highlighted the contributions of key partners and champions, such as CoP members from the Zenex Foundation and Sasol Inzalo. Suzanne Hattingh followed on from Barbara and discussed the various components that make up the map. Suzanne, an expert in learning strategies and skills development, worked closely with BRIDGE to develop the map’s content. She explained that the resource comprises four clear pathways and offers information on the benefits and values of each. The map makes a particular effort to foreground pathways aside from higher education, and focuses especially on informal skills acquisition. In the wake of South Africa’s skills deficit, especially with regard to technical competencies, a move away from tertiary education to more industry-specific qualifications is critical. BRIDGE celebrates its 10th year! Enjoy reading our latest news?